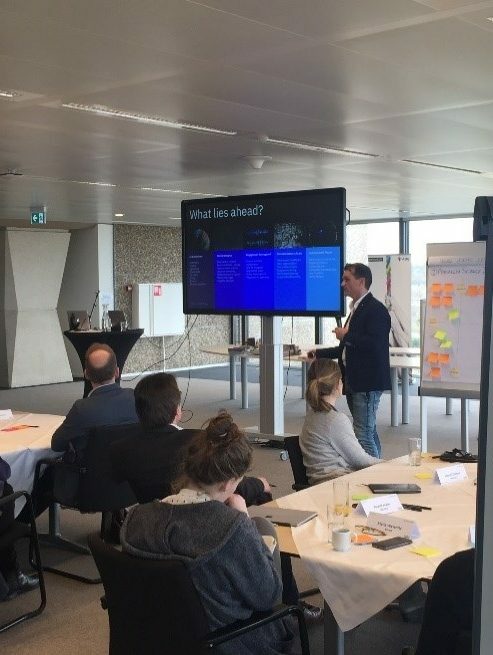 The BISS Institute hosted together with EDLAB, UM Library, MUMC+ and IBM Benelux, the first Artificial Intelligence (A.I.) & Cognitive Computing in Education Ideation Session on 5 April 2018. With more than 40 students, teachers and UM staff from all faculties. Does Artificial Intelligence have the potential to make a real difference with regard to educational innovation within Maastricht University? Therefore, participants co-created and pitched roadmaps and use cases for A.I. at UM and MUMC+. “Olli, the self-driving vehicle” chats with passenger while driving to his intended destination; students at the Deakin University make use of a personalised digital assistant called “Genie” that guides them through their study day; cognitive systems that recognise learners’ needs and direct their pathway accordingly. Sounds like a futuristic science fiction movie. In his presentation, Gerard Smit, Chief Technology Officer at IBM Benelux, proved us wrong. These are all current examples of IBM’s A.I. system Watson. In fact, IBM Watson provides cognitive solutions and personal learning ecosystems that can help teachers to understand and reason students learning aptitudes and activities. It only needs data, algorithms and computing power. Students and teachers from all faculties and across disciplines shared their pains and gains at UM. Cohesively, students talked about information overload, a lack of interdisciplinary and diverse courses and a better guidance towards the future. Teachers were dealing with demanding group dynamics, poor information on student’s study effort and a lack of alignment between faculties. Drawing on this, all seven groups pitched their solutions on A.I. in education. envisioned the post-graduate medicine group. Keeping in mind that to pursue a medical degree and becoming a doctor, students need to meet certain competences that are defined by the Dutch government. BA Global Studies, is an interdisciplinary 3-year bachelor’s programme aiming to train students in the analysis, skills and attitudes necessary for understanding and solving complex global problems for the 21st century. Integrating knowledge and skills that pertain to the humanities, social sciences, health and psychology. Suboptimal group experiences during the student’s courses let the global studies group focus on collaborative work and group composition for students. Especially in a PBL classroom, dealing with diversity, communication, interpersonal skills and inclusivity are relevant for the course success. But how to create such a collectively intelligence? Once defining PBL group criteria, a smart (A.I.) module can help teachers to create and select diverse groups and support teachers, in real time, to identify individual needs in the group. Eleanore (18 years, still in college) asks herself whether studying law is a good match for her. Brian (current student), wants to work more interdisciplinary such as connecting law with technology. Fabricia (graduate) misses Maastricht University terribly and wants to stay connected. Why not developing a platform to support these students along their lifelong study career? said one student of the law group. Incorporating technology in law students’ trajectories can help graduates to obtain the right skill set that prepares them for a digital and technology driven future. The group also suggested a comprehensive platform that asks the right questions and provides selected information to help students finding their way, assessing their progress, seeking assistance and – more broadly – enhancing their learning experience through the academic pathway. Is A.I. a solution for our PBL system? In a final discussion, UM colleagues raised fundamental concerns whether A.I. is the solution to a PBL system that is in itself highly innovative. “A.I. is very good in providing those personalised solutions and therefore we create a problem to match the solution of A.I. (…) we should have the independent discussion whether this personalisation is always valuable.” said prof. Swierstra from the Faculty of Arts and Social Sciences. Given these constraints, it is from utmost importance continuing these discussions and start to experiment with defined use cases. To conclude the session, academic director Rudolf Mueller (BISS Institute) stepped in front of the audience. He encouraged participants to ask themselves how to use the state of the art technology right now, to improve learning for students and teachers. Doing so, requires defining use cases, exploring small experiments and pilots with go/no go moments in between. While the practical question is: how do we manage our educational system to make PBL more valuable for our students? Try it out and make experiments!